Just look at this gorgeous room designed by Philippe Starck. 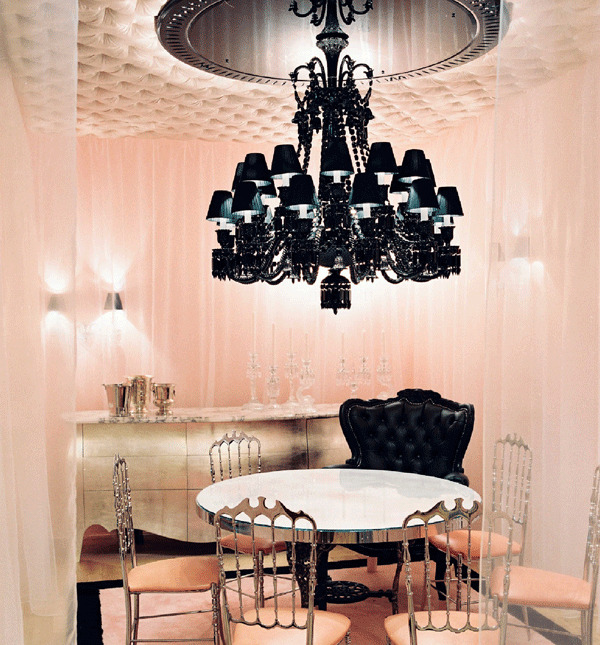 Panels of chiffon and a button tufted ceiling soften the drama of the lacquered black chandelier and arm chair. A room awash in soft pink is the perfect background for a bold color accent and helps create a focal point for the room. With such an grand design, the entire room works to create a cohesive look without all the elements competing against each other. Now you may be thinking "wait a minute, I thought this was a wedding blog. Why are we getting a crash course in interior design?" Well, we can take the a few of the design principles of interior design and apply them to your wedding. With the wealth of information available on the internet, a bride's dream wedding can get lost in the shuffle by trying to apply too many trends or subscribing to the notion that more is better, bigger is better. Highlighting a few key pieces make much more of an impact than incorporating everything. After all, a little restraint goes a long way. Light, romantic pink paired with a bold black is one of my fave wedding combinations of all time. Something about it scream Paris, and we all know that's one of the most romantic places in the world! This room is incredible. I want this room!! So gorgeous!! Sound advice! I know many bloggers who find inspiration from design blogs. Some of them are also also great for DIY projects and flea market finds. The chandelier & all of the chiffon would make a very glamorous dressing room at a store! That's what I thought it was at first! This is one gorgeous room!! !I'm a bid fan of Philippe Starck's work! He is a genius!! I want to live in that room...fabulous!